On Tuesday, December 6, the Toronto Chapter of CSC will co-host a dinner meeting with the Canadian Institute of Quantity Surveyors (CIQS), examining completeness of contract documents and issue management. On Wednesday, September 9, the Edmonton Chapter of CSC is hosting a breakfast talk dealing with the various challenges associated with large-format tile. Rendering of the new Canadian Broadcasting Corporation (CBC)/Radio-Canada building in Montréal. 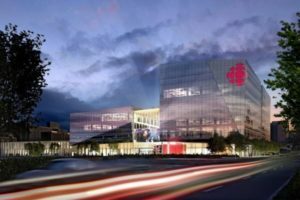 “The new Maison de Radio-Canada will not only be esthetically pleasing, but also improve the future of broadcasting in Montréal with the largest broadcasting datacenter in Canada including benefits such as more predictable operating costs” said Roger Plamondon, president, real estate development and acquisitions, Broccolini. The 38,833-m2 (418,000-sf) headquarters is expected to improve collaboration, innovation, productivity, and safety with new critical equipment, systems, and infrastructure. It will also feature green spaces and rooftops along with water and energy management. Johnson Controls is supplying technological solutions, such as card access, video management and air handling units. It will also provide life-cycle services to the CBC/Radio-Canada for a guaranteed fixed cost for the next 30 years. Construction on the project is set to be completed late this year, with a move-in date of early 2020.